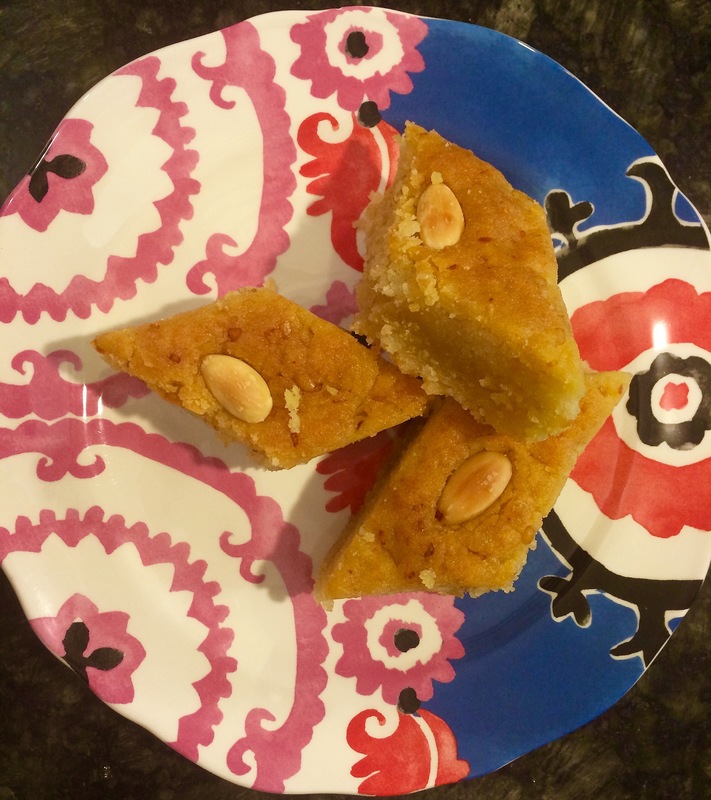 Helbeh (Fenugreek Cake) – One Half Indian. Fenugreek is traditionally used in curries and savory dishes. If this is how you know fenugreek, it may seem strange to put it in a sweet, but it is delicious in this cake. This recipe is from Yottam Ottolenghi’s and Sami Tamimi’s cookbook Jerusalem. 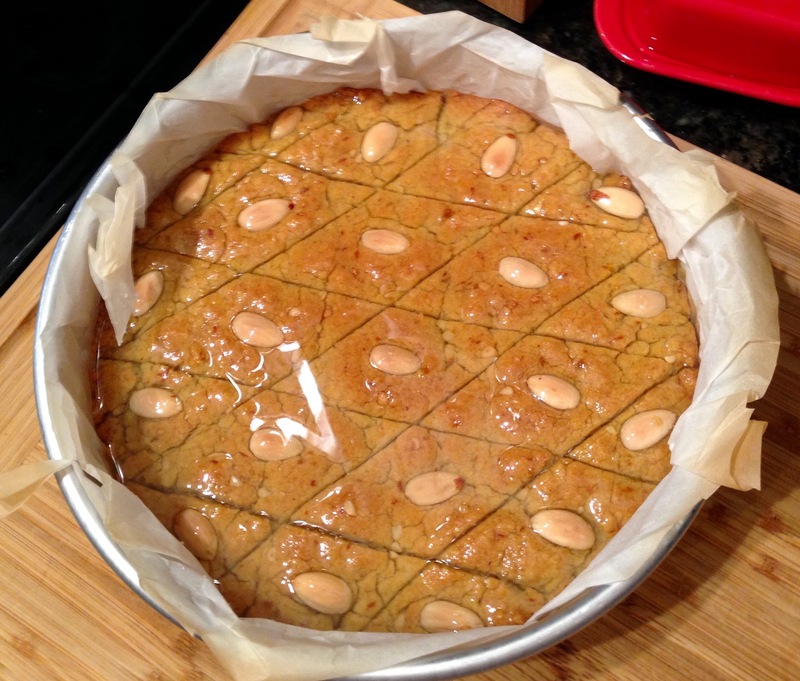 Helbeh is Arabic for fenugreek, so I guess in India this would be a Methi cake (methi = Hindi for fenugreek). The directions for this cake say it must be left to sit for 24 hrs. Don’t scoff at this part. This cake really does need to sit. The fenugreek in the cake sticks out and tastes funny right after the cake is done. This sweet really needs a day to marry all the flavors together. Mix the semolina, flour, and pine nuts in a large bowl. Add the oils and melted butter and mix well. I mixed the oil with the flour by putting the flour and oil between my hands and rubbing the palms of my hands together. I repeated this over and over until the oil was evenly distributed in the flour. Set aside. Put the fenugreek seeds and water in a medium saucepan and bring to a boil over high heat. Decrease the heat to low and simmer for about 25 minutes, until the seeds are plump and tender. Drain the seeds, reserving the cooking water, and add them to the semolina mix. Add the yeast, baking powder, and salt, then gradually stir in 3/4 cup of the hot fenugreek water; if you don’t have enough liquid, make it up with water. Knead the dough on a work surface until is is completely smooth. Grease a 9 1/2 inch round cake pan with butter and line with parchment paper so that the paper. Pour in the semolina mixture and press it down with your hand so it is level and smooth. 4. Use a small, sharp knife to score the surface of the cake with parallel lines 1 inch apart, followed by another set of lines at a 45 degree angle, creating a diamond pattern. Place 1 almond in the center of each diamond. Cover the cake pan with a clean tea towel and set it aside somewhere warm for about 1 hour. Toward the end of the resting time, preheat the oven to 425 F, making sure you allow plenty of time for your oven to heat fully. 5. Put the cake on the lower oven rack and bak for 20 minutes. Lower the heat to 400 F and bake for 20 minutes longer, until it is golden brown and a skewer inserted in the center comes out clean. I moved my cake to the top rack for about the last ten minutes to get a bit more brown. 6. Prepare the syrup while cake is in the oven. Place the sugar and water in a small saucepan and mix well with a wooden spoon. Bring to a boil, add the lemon juice, and simmer gently for 4 minutes. Take the syrup off the heat, allow it to cool down just a little, and then add the orange blossom and rose waters. 7. When the cake is finished baking, remove it from the oven and immediately drizzle the syrup all over it, making sure you use all the syrup. It will seem like a hell of a lot of syrup and be sitting in a pool on top of the cake at first. That’s okay. Still use it all. Leave the cake to cool completely, then cover well with aluminum foil or parchment paper and store in fridge. Serve the next day. 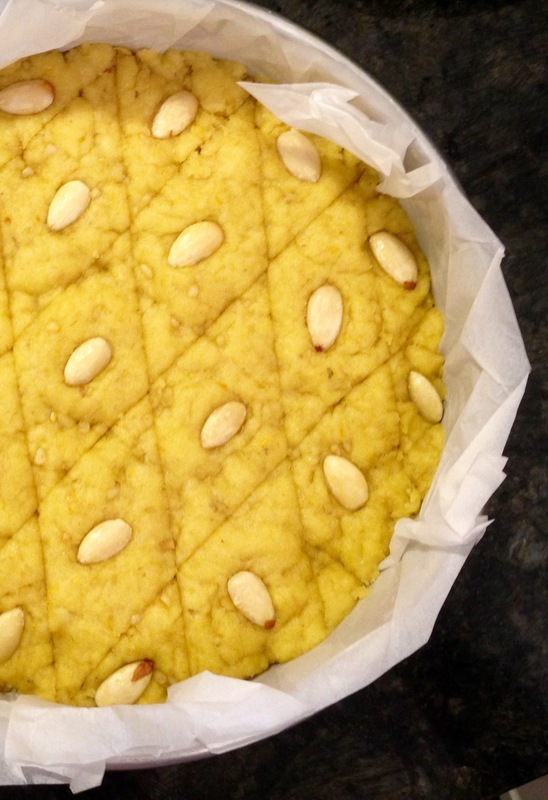 Looks great, I’ve always been curious about fenugreek cake ! Thanks! It’s delicious. I made it for my vegetarian mother-in-law who does not eat eggs. It was a hit.